Two projects from Goldsmiths were yesterday voted the best “profit with purpose” initiatives at the Semi-Finals of the 2018 Santander Entrepreneurship Awards. In ICCE we are very proud that one of those was from Jack O’Donoghue on the MA Social Entrepreneurship (above, third from right). 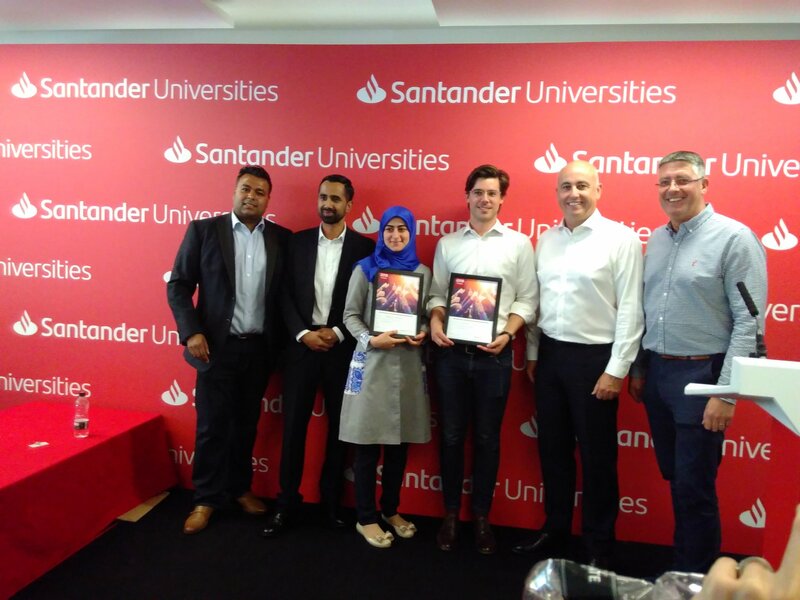 Santander Bank Universities division have been running their annual Entrepreneurship Awards since 2011, showcasing and rewarding the best new ideas from university students, graduates and staff. The Southern Region Semi-Final was held yesterday in London at the rather sumptuous University of Liverpool’s London campus near Moorgate. Richard Hull went along to lend support to Jack, from the MA Social Entrepreneurship, and also to Rehana Al-Soltane @rehana_makes from Brunel University (above, fourth from right), who was present on behalf of Goldsmiths’ Hadeel Ayoub @HadeelAyoub studying for a PhD in Arts and Computational Technology with @goldcomputing . Jack @jackod100 was presenting his project ‘Of The Ilk’, which is making and selling an organic cotton-based re-usable food wrapping as an alternative to cling-film. Hadeel and Rehana have developed a ‘smart-glove’, BrightSignGlove which interprets British Sign Language movements and converts them to text. The Awards were this year grouped into two categories – ‘Tech’ and ‘Non-Tech’ – and 10 projects from each category were selected from approximately 600 entries to compete in the Semi-Finals. Two projects in each category were then yesterday selected by the judges to go forward to the Final in November where they will compete with another eight projects for over £80,000 worth of equity-free seed-funding, mentoring, a week-long accelerator, and a fully-funded intern. But this year, for the first time, there was a special additional award from each category, voted on by attendees, for the best “profit with purpose” project demonstrating social, community or environmental impact, with a potential prize of £7,500 equity-free seed-funding, the accelerator week, and a fully-funded intern. This year was the first time any projects from Goldsmiths have been submitted, and both of our two entries have succeeded in going forward to the Finals in the “profit with purpose” category. Huge congratulations to them, and we all wish them the very best of luck. Richard Hull recently met up with Tom Barrett @tbarrettwrites a multi-talented Editor of two interesting magazines – Environment Journal and New Start Magazine, the UK’s first magazine devoted to regeneration. They had a really useful and interesting discussion about all things social enterprise and why the UK is such a good place to study it. Tom has now written this up for both magazines. New Start is behind a paywall but you can read the interview for free here on Environment Journal.